A fascinating app that uses questions and prompts to help kids better understand themselves and others. Me by Tinybop is a unique kids' app that asks questions and offers inspiring prompts to encourage a child to create a digital portrait. The result is a visually exciting mind-map filled with personal drawings, photos, sound bites, stories, impactful words, and more. The app starts by asking the player to create an avatar, using a simple interface filled with a multitude of options. This avatar resides in the lower center of a large field filled with a variety of floating icons. The pencil icon represents a drawing prompt. 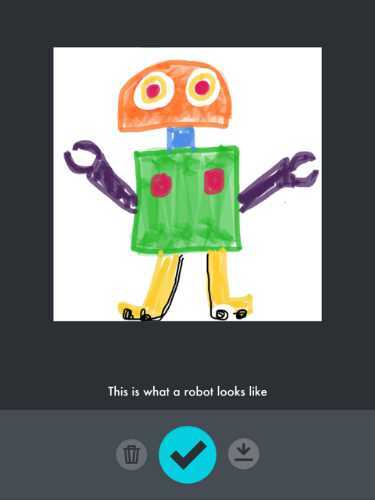 Kids might be asked to draw a robot or something that makes them feel scared. The microphone icon represents a recording prompt. Kids can choose to respond to prompts that might ask about their biggest secret, three important wishes, or the sound they make before they go to bed. The question mark icon represents writing prompts. What is your earliest memory or how did your parents meet? There is also an icon that represents a choice prompt, where players might see several images and then be asked to select one. The images could be of places to visit or houses to eventually live in. It addition to answering questions and prompts about yourself, Me asks kids to reflect on topics. There is a Friendship area where kids will be asked to create avatars of their BFFs. In the school area, they may be asked to draw pictures of their school building and mascot. In the family area, kids can create avatars of their parents, siblings, and extended family to populate a family tree. This is an area where there are a lot of questions about family life. The app also makes fun use of colors. 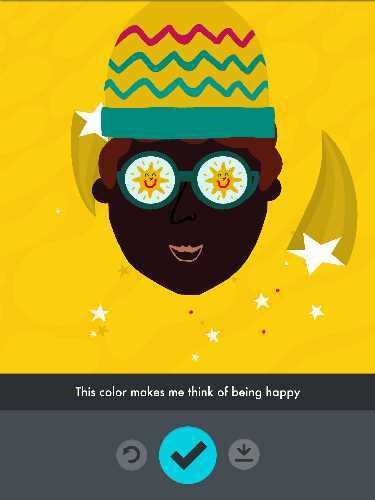 In addition to asking about a child's favorite color and then filling the work field with that color, the app also has kids associate feelings with certain colors. As a player actively engages with Me, the work space fills up with photos, drawings, animations, and more icons to explore. The result is a multi-faceted digital self that seems to pulse with life. Me by Tinybop is a brilliant way of getting kids to reflect on themselves and others. As they answer questions, draw pictures, and respond to the prompts that interest them, they see a representation of a complex self emerging on the screen. 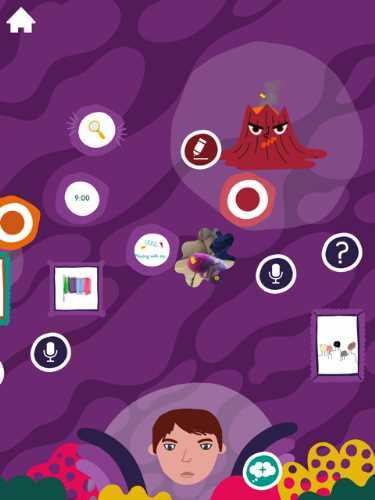 Throughout this creative process, the child's avatar appears blinking its eyes as the icons and images float above it. 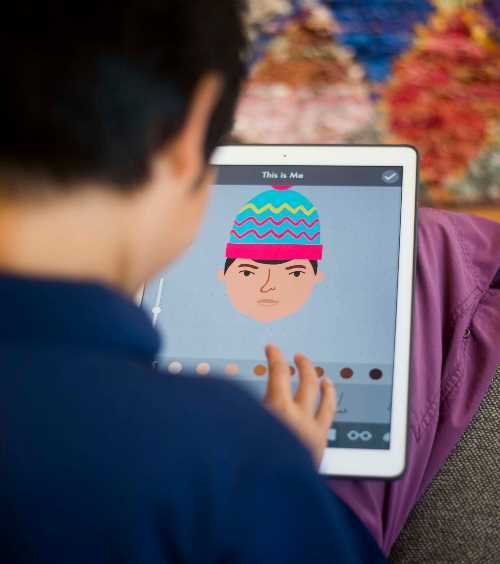 As a child responds to the app's hundreds of prompts, a digital self-portrait emerges that is exciting to see, because it is filled with animations, images, and dynamic representations that reflect the personal things kids said, wrote, or drew. Since much of what kids are doing is very personal to them, the app is careful to put the player in control of what he or she wants to share. 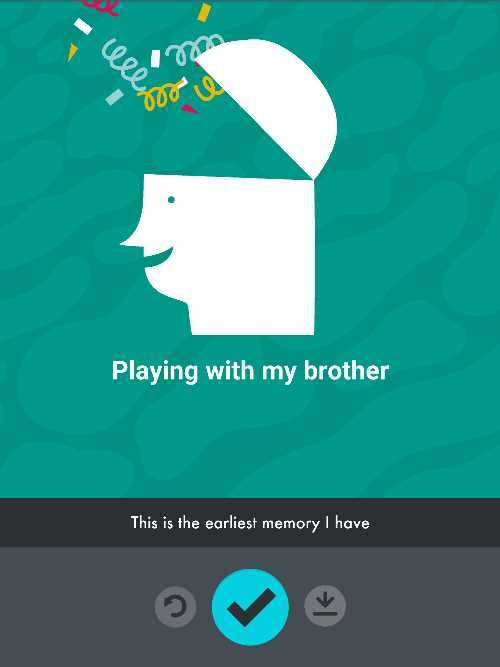 As the child contributes his or her thoughts and stories, the app lets the player decide what gets shared outside of the app. For example, if a player likes the avatar that she constructed of her Grandma and wants to share it, the child can decide to download the Grandma avatar to the device's photos and then share it further from there. We applaud the app's providing for multiple profiles, so that families with more than one child can play. But, we don't like that a younger brother could sneak into an old sister's profile to see what she was saying. We think the addition of a personal password for each user should be added to protect each child's privacy. Me by Tinybop is a great app to use with kids, to help them understand who they are and why each person is unique. In the reflective process of building a digital self-portrait, kids become more self-aware. As they also reflect on the others in their life, they see that each person is different. This app encourages kids to understand who they are, accept others, and celebrate our differences. That's powerful stuff for one app to cover! 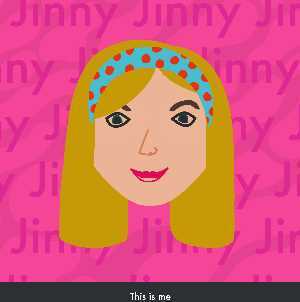 This Me by Tinybop app review was written by Jinny Gudmundsen.